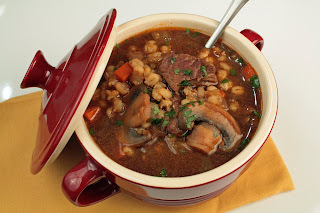 This looks like a great meal for the current weather,: warm and comforting plus it is hardy! I will have to try this one out soon. This soup looks so hearty and comfy. Wow! This is my favorite soup. It is a whole meal in one, it tastes wonderful, and the flavor of it added a wonderful fragrance to the whole house. I must admit though that I put one whole cup of wine. I used your recipe to make a variation of this yesterday for my family. It was delicious! Thank you for sharing! I make this fantastic soup all the time now. There is always some in the freezer because we like it that much. Excellant. We never get tired of it and think it is the best soup ever! !